Last Christmas I made a dreamcatcher for each of my daughters. They selected the colours and beads, so they are not exactly how I would have chosen but they love them and they are not that hard to make. 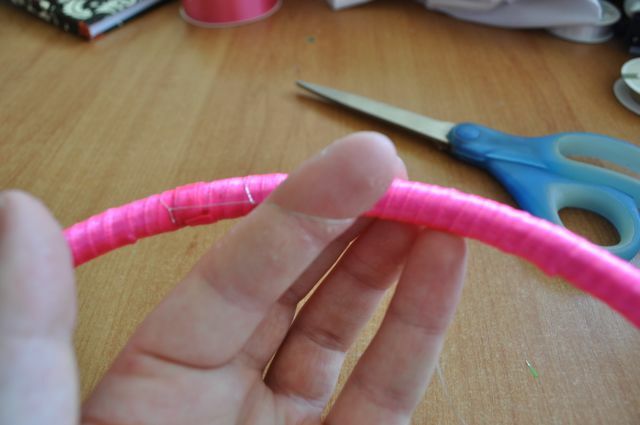 To start with glue one end of the ribbon to the ring, then wrap it around repeatedly to cover the entire ring. 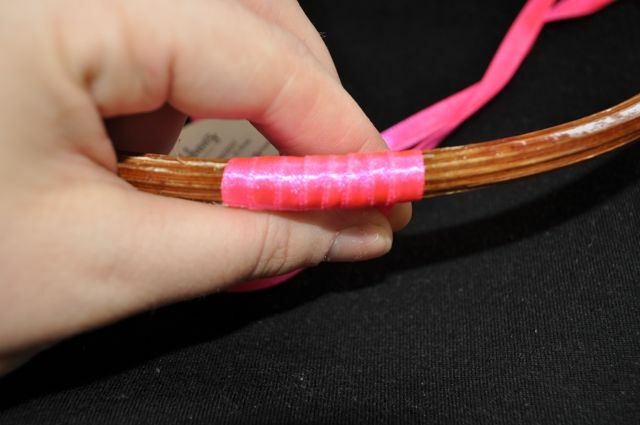 As you can see in the image below you wrap the ribbon on an angle. Once you have covered the ring in your desired ribbon tie one end of the cotton to the top of the ring. You will be creating a spiderweb with the cotton throughout the middle of the dreamcatcher. It doesn't matter what length of cotton you start with as you can always tie more cotton into the dreamcatcher, so work with a length you are comfortable using. With the cotton tied to one point, loop it under the ring with your finger between the cotton and the ring. Bring the cotton back over the top of the ring and slide it between your finger and the cotton. This is kind of like producing a look looped knot. Pull to tighten it, then repeat this process the whole way around the ring. The reason I place my finger in the position is because it makes it easier to create even spaces with the cotton. 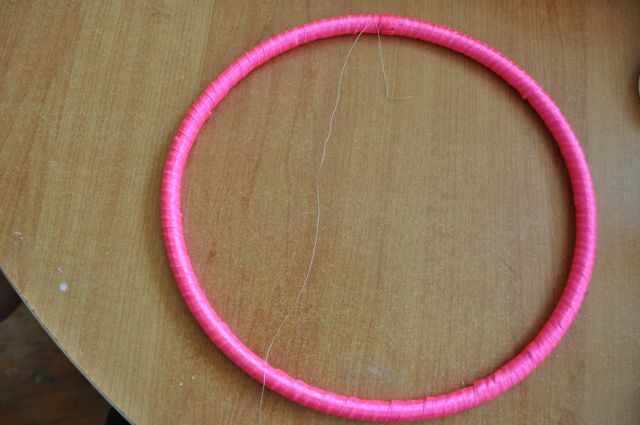 Once you have gone around the entire ring you will be going around again, but instead of looping the cotton around the ring you will be sliding it between the middle of the cotton from the first time around the ring. So this time around the ring the cotton you are working with never touches the ring. As you go around and repeat this you will see a spiderweb pattern emerge. 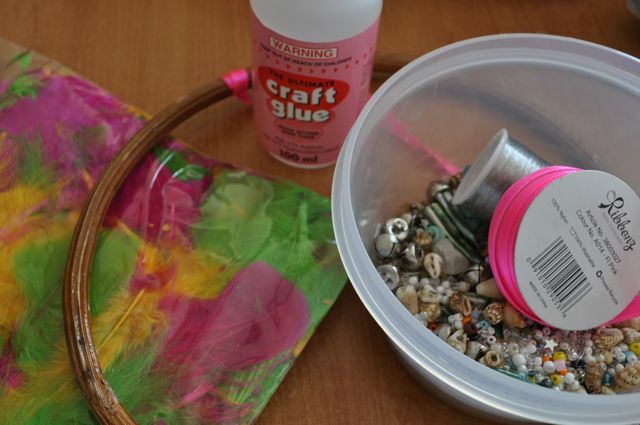 When you are creating the spiderweb you can slide beads onto the cotton anywhere you like to add a prettier touch. When you get to the middle of the web and there is nowhere to go get a bead and slide it onto the cotton, Knot the cotton around it to secure the center of the web and make it look nice instead of just being a knot in the middle. Next you glue feathers on the dreamcatcher however you like. 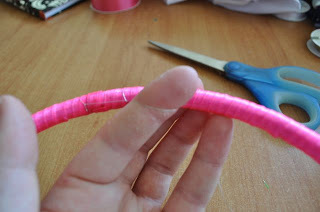 Cut some lengths of string and tie/glue feathers to them as well at varying lengths as you can see in the image above. Finally, cut some ribbon as long as you like to glue at the top of the dream catcher. This is what you will use to hang the dreamcatcher and it covers up the original knot of the cotton web in the middle. The most time consuming part is creating the web, but once you get into a rhythm it is quite easy. 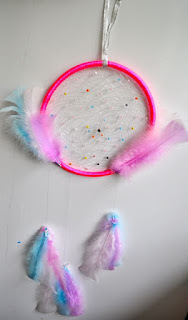 Have you ever made a dream catcher? That is awesome, great job!